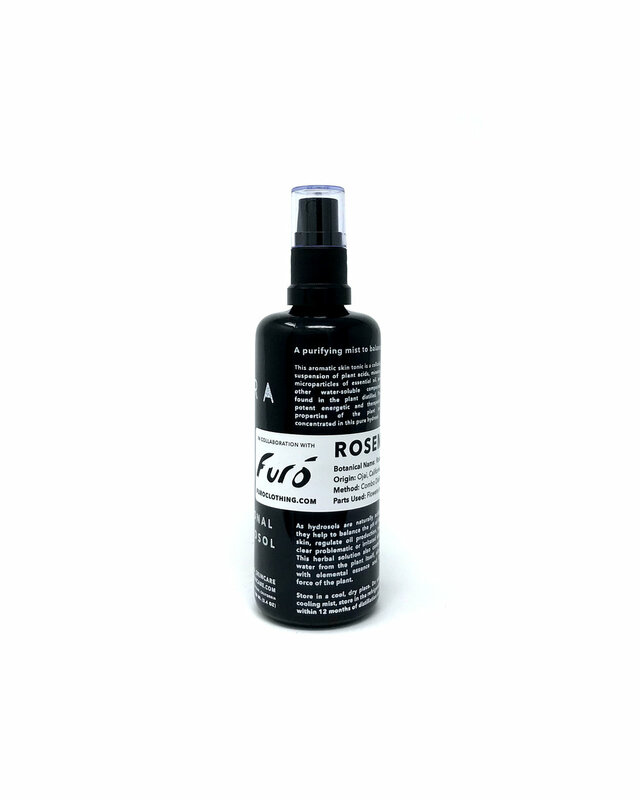 This aromatic skin tonic is a colloidal suspension of plant acids, minerals, microparticles of essential oil, and other water-soluble compounds found in Rosmarinus officinalis. The potent energetic and therapeutic properties of Rosemary are concentrated in this pure undiluted hydrosol. Mist onto face, neck, and chest after cleansing, or whenever your skin needs a boost. Your hydrosol may be used as a therapeutic mist or as a hair and scalp tonic, and can be added to baths or diffusers. Store in a cool, dry place. Do not expose to direct sunlight or heat. For a cooling mist, store in the refrigerator. Discontinue use if irritation occurs. Use within 18-24 months of distillation date. 100% undiluted Rosemary Hydrosol, less than 0.5% nano silver. This product was created and distilled as a limited edition collaboration with Furo Clothing.